Covering an area of only a few square kilometers, Manila Chinatown is jam-packed with history, cultural quirks, bustling commerce and, of course, gastronomic delights. Since the Sung Dynasty (A.D. 960-1279) centuries before the arrival of Spanish conquistadores, this riverside area has long been a trading post between native Filipinos and visiting Chinese. Officially established in 1594 when the Spaniards gave the parcel of land tax-free to Roman Catholic Chinese, Binondo is the oldest Chinatown in the world. The Chinese were given the privilege to self-govern, anxiously within range of Intramuros cannons across the river. • Alight at Carriedo LRT station, and walk across Plaza Lacson where some horse-drawn kalesas are parked. Note the neoclassical facade of the Prudential Bank Building. • Turn left to Santa Cruz Church, and traverse Plaza Santa Cruz by the Carriedo Fountain. • Enter Manila Chinatown through the Arch of Goodwill. To your left is the Monte de Piedad and Savings Bank building – the oldest savings bank in the Philippines. • Walk up Ongpin St. past jewelry shops, traditional medicine shops, and sidewalk vendors selling Chinese trinkets, snacks and fresh produce. • Burn those calories and get back to Ongpin St. – walk down through the Welcome Arch and light some incense at the Santo Cristo de Longos Shrine – an intriguing fusion of Roman Catholicism and Chinese worship in honor of a miraculous crucifix found in an old well. • Take home some ube (taro) hopia from Eng Bee Tin, or tabliya (chocolate tablets) from one of the oldest chocolate factories, La Resurreccion across the street. • Turn right to Nueva St. for some more munching at Dong Bei – try their delectable northern-style kutchay (chives) dumplings! • Get back to Ongpin St. and find your way to the Ramon Ongpin Monument to learn more about the man the street was named after. • End your walk by visiting Binondo Church to admire the ceiling paintings, and strolling by Plaza San Lorenzo Ruiz with its fountain and monuments to St. Lorenzo Ruiz – a Filipino-Chinese martyr; Filipino-Chinese WW-II soldiers; and Tomas Pinpin – the father of Philippine printing. 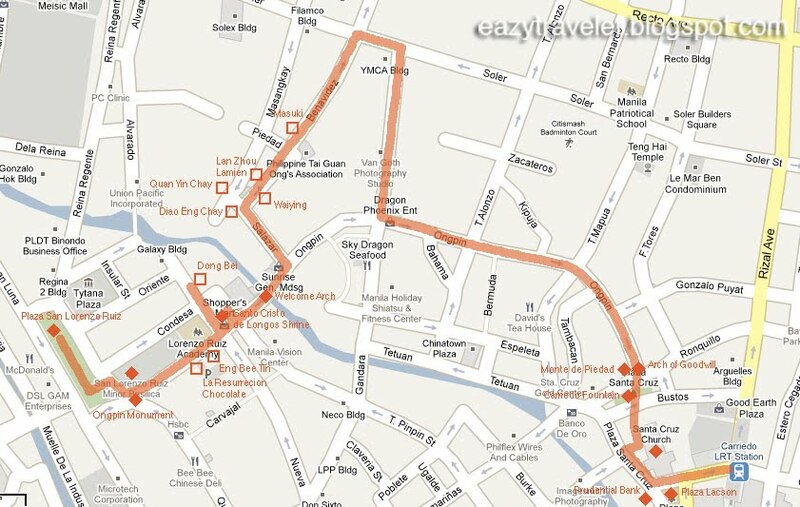 From the plaza, you can catch jeepneys to Intramuros or Malate. (L-R) Binondo Church, Lan Zhou Lamien & Santo Cristo de Longos Shrine. 3. Sidewalks can be crowded with street vendors, so you might have to walk on streets. Watch out for cars, tricycles, and horse-drawn kalesas. 4. The best time of the year to visit is Chinese New Year when the district livens up with decorations, special treats like moon cake, and lion dances! 5. You may do this walk in reverse, and continue your walk to Quiapo. Read DIY Walking Tour – Quiapo. Thanks for this post, we’ll definitely give it a go. Thanks for your blog. This was our guide during a recent walking tour I took with the family and a couple of friends. I posted a video on YouTube video of our experience. Please do check it out. Link is below. Blessings!